As you probably all know by now, the legendary superhero-generating machine Stan Lee has died at the considerably old age of 95. While Stan Lee’s achivements weren’t of the automotive variety, he did contribute some things to the world of automobilia, including one of the strangest superhero cars in all of, um, superherocardom. 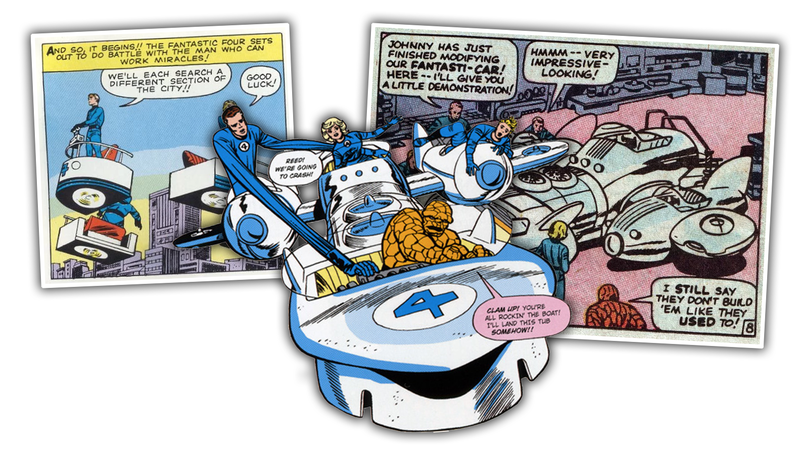 The superhero car in question is the Fantasticar, the aircraft like thing that was nevertheless called a car by the people who used it, the Fantastic Four. I should mention that whenever we talk about the Fantastic Four I should be clear that not all the credit should go to Stan Lee. Stan Lee and Jack Kirby were very close collaborators on the series, and as to who exactly came up with what first I really can’t say. But, for our limited purposes here, we can say the Fantasticar first showed up in the March 1962 Fantastic Four #3 comic, and Kirby and Lee were directly involved. That’s good enough, I’d think. I like the Fantasticar because, of almost all the famous superhero cars—the Batmobile, Green Hornet’s Black Beauty, Superman’s ‘79 Oldsmobile—the Fantasticar is remarkably, um, dorky. It looks like the public tram you’d find at a municipal park, or perhaps a special bathtub used to help give therapeutic baths to elderly people with limb problems. Yes, it appears to be able to hover and fly and is capable of all kinds of aerial acrobatics and incredible speed, but would it have killed Reed Richards to stick a roof and a windshield on that thing? The Fantasticar was able to separate into multiple modules, so each Fantastic Fourth could travel independently. It seems to have had incredible range, as well, but it just seems so impractical. Wasn’t it cold as hell? How was the wind not a huge problem? What about privacy? Don’t papers and pens and things fly out of it all the time? It just makes no sense. The Mark II version did look sleeker, sort of, but it was still awkward-looking and while resembling jet aircraft now, the fundamental design was still that of a bathtub, just now multiple streamlined bathtubs that linked together. Sure, it has a range of over 3000 miles, but you’ll be cold as hell and possibly wet the whole time. Other versions cleaned up the design a bit, but all had the same convertible-aircraft design. Maybe there were advanced force fields and extremely effective heat blowers and everyone was diligent about applying sunscreen, but I’d have still wanted a windshield and a roof. Yes, the Fantasticar was made by Dodge, as you can see by the trademark crosshair grille. This one was from 2007's Fantastic Four: Rise of the Silver Surfer, which would make it a Cerberus-era Dodge, which might explain why there was no R&D money around to develop things like, oh, a roof or windows for this very fast aircraft. This commercial says both that it’s “proton powered” and that it “has a Hemi,” two statements I’m not sure how to reconcile. Does it have a separate conventional Chrysler hemispherical-combustion-chamber internal combustion engine as well as whatever the hell “proton power” is? What do they use the Hemi for? Powering the 12V sockets? Despite all its puzzling flaws, I’m glad the Fantasticar exists, as it sort of encapsulates Stan Lee’s overall approach to the superhero genre: don’t make them perfect, but make them interesting, not so self-serious, and fun. The Fantasticar was certainly all that.